Late last week, Kurdish militants destroyed a Turkish Army Leopard 2A4 tank, reportedly by a Soviet-era anti-tank missile launcher in the course of Ankara's operation against Kurdish fighters in Syria. Why could such a thing have happened to the allegedly “indestructible” German tank? Military experts point to the vulnerable ammunition compartment as the Leopard-2’s weakest point. “It has been proven once again that the much-touted Leopard-2 tanks have a fatal defect, as most of their onboard ammunition is stored in the forward left section with weak armor protection on both sides,” specialists at Russia’s center of Strategy and Technology Analysis wrote after watching a video of the destroyed Leopard posted by the Kurdish militants. 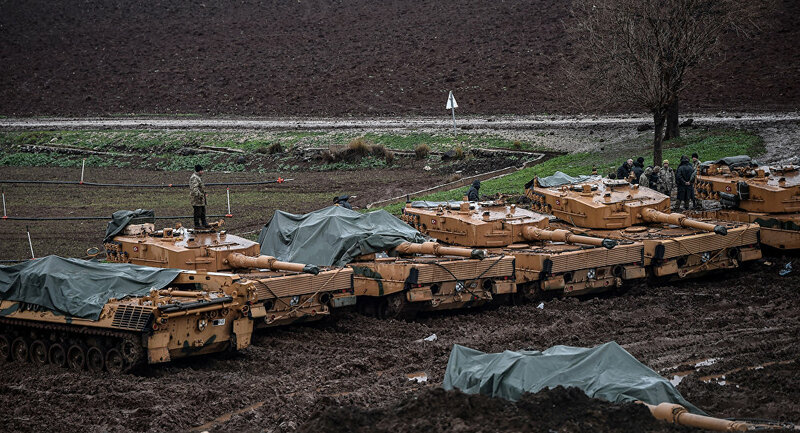 They added that the first cases of Leopard-2A4 tanks being destroyed as a result of their onboard ammunition blowing up pertain to tanks the Turkish army lost when fighting Daesh forces near Syria’s al-Bab in December 2016. Experts believe that the Leopard near Afrin was apparently taken out by a Fagot antitank missile launcher, developed in the Soviet Union in the early-1970s, about a decade before the first Leopard-2 tanks came along. Ankara launched an offensive with the support of the Free Syrian Army forces in the Syrian Kurdish-dominated city of Afrin on January 20, aiming to protect its borders from what they call a "terrorist army," referring to Kurdish militant groups in the area. The operation, dubbed Olive Branch, primarily targets the US-backed YPG, which are considered by Ankara to be affiliates of the Kurdistan Workers' Party (PKK), designated as a terrorist organization in Turkey and several other countries. Official Damascus has already condemned the operation as a crude violation of its borders and international laws. Russia has expressed concern about the humanitarian situation in the region and calls for the preservation of Syria’s territorial integrity.